Giovanni Traverso and Robert Langer are pioneers in the field of ingestible devices. Their combined efforts have developed sensors that could monitor breathing rate, heart rates, and temperatures. They have even developed a drug delivery system that gives systemic release of pharmaceutics for up to two weeks. The biggest challenge to internal devices is powering them. Conventional batteries are toxic if consumed. Their newest device is a sensor that is instead powered by stomach acid. The research teams from MIT and Harvard Medical School knew that they had to develop a system that was strong enough to power a sensor but safe enough for consumption. The one thing that is abundant in the stomach is acid. The teams took inspiration from a simple voltaic system, the lemon battery. 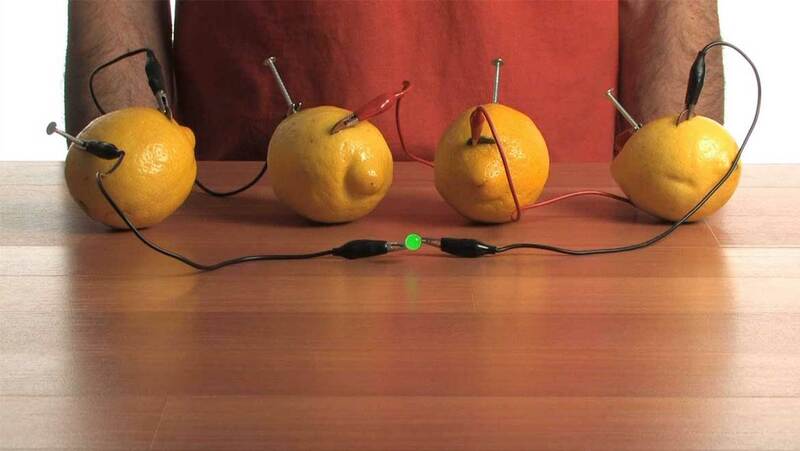 In this system, two metal electrodes, a copper cathode, and a zinc anode are stuck in a lemon; the citric acid acts as the electrolyte, carrying electrons from the zinc to the copper. The zinc anode slowly erodes while hydrogen gas is generated at the cathode. The hydrogen source is the acid, which is dependent on pH. The difference in the electronegativities between zinc and copper drive the reaction, creating a current in the process. The scientists replicated the lemon battery by placing a 900 MHz transmitter and temperature sensor on an ingestible device equipped with copper and zinc electrodes. Magnesium was also considered to replace zinc, but the lifetime of a magnesium anode device was short. The zinc anode device was then fed to a pig and upon contacting stomach acid, the device powered up. The device began transmitting data every 12 seconds to a receiver 2 m (6.6 ft) away. The team tracked the device through the digestive tract, a journey that took six days. Once the device left the stomach, there was a dip in performance. The stomach pH varies from pH 5 when fed, to pH 1-3 when hungry. As material moves through the intestines, the pH can be anywhere between 5.3 -7.8; a pH of 7 is neutral. Without acidic protons, the voltaic cell stops operating. The locations of the device were confirmed using serial X-rays. The power that the bio-voltaic cell generates can be increased by using a commercially available energy-harvesting boost-converter integrated circuit. The cell generates 0.1-0.2 V and is stored in a capacitor at 2.2-3.3 V. Batteries store energy by electrochemical reactions, capacitors store energy within an electric field generated between plates. The major source of energy consumption is the transmission of data. The energy in the system can be conserved by increasing the delay between data transmission. To demonstrate the energy harvesting system, the team fabricated a device that would trigger drug release when a specific voltage was attained. The team encapsulated a compound called methylene blue within a gold membrane. Gold is inert to gastric juices but is electrochemically eroded when the potential reaches +1.04 V in the device, releasing the methylene blue cargo. This study demonstrates in vivo characterization of bio-galvanic cell produced from biocompatible materials. Coupled with drug delivery, these bio-galvanic cells demonstrate an alternative to existing invasive treatments. Diagnostic procedures like endoscopies or colonoscopies can maybe be replaced with a pill. An intestinal tumor could potentially be treated on site without subjecting the entire body to chemotherapy.